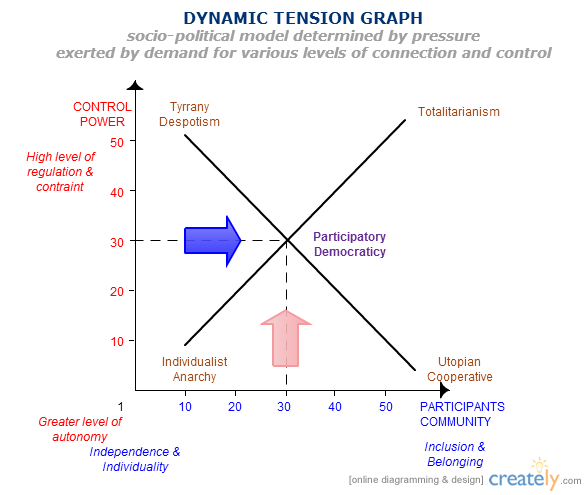 Here is a graph I created that illustrates my theory on political systems being effected by human desires to 1) restrict or relax control and 2) be individuals and yet be part of a collective group. Click on the graphic to enlarge. Obviously the visual and analytical part is derived from the basic supply & demand graph. The political power aspect is based on Psychologist/Educationist William Glasser’s “choice theory” where we either try to control others or try to connect with others. The social participation aspect was inspired by Philosopher/Theologian Paul Tillich’s assertion that we all have equally powerful drives to individuate (“be ourselves”) and at the same time belong to a collective community which is bigger than ourselves. I’ve written about this on this blog before.See previous post on Sociological/Political Theory. I was frustrated by the traditional Liberal/Conservative continuum that most Social Studies & Civics/History teachers ascribe to. I felt like something was missing. It was too limiting. I felt like Soviet Communism and Fascist dictatorships had more in common than they had different, but on the traditional continuum, they were supposed to be polar opposites. I believe what they have in common is control. Also, I think of myself as fairly “Liberal/Progressive” but I’ve got a truckload of friends who consider themselves “Libertarian/Tea-Party” conservatives, one Army Special Forces veteran who is a self-described “Anarchist,” and what I’ve found listening to these folks is that in some cases, they actually had more in common with “Occupy Wall Street” style Liberals than other Republicans. This threw me and I wanted to try to develop a schema which would help make sense of these discrepancies. My hope is that this graphing model will help analyze, understand, visualize, and discuss these concepts with a little more flexibility and depth than the old fashioned Right/Left line model. What do you think? I’d love to get a discussion going for once. Please leave your questions or contributions in the comments below.